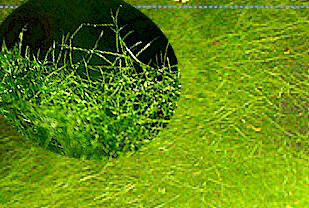 Hair Algae will start growing if too much light are provided or extra nitrogen that the plants can't use-up. Another condition that will cause Java fern to melt is a proliferation of blue-green algae--bluish-green "algae" that grow like film (actually they are cyanobacteria, bacteria that photosynthesize like algae) that feels somewhat slimy and smells unpleasant. It tends to grow in aquaria with plant nutrient deficiencies. 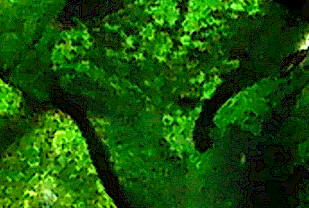 Q: There is lot of algae build-up in my pond that lasts about six weeks. Would snails help to eliminate this problem? If so, can I use normal wild snails found in most outdoor ponds. 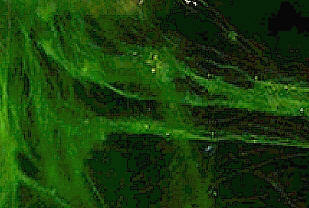 A: Most ponds do "green up" your pond is having a dense bloom of planktonic algae? Frequently, the bloom is so thick that the water looks like pea soup and the fish become totally invisible. And they don't often go away after a few weeks and may hang around all year round in tropical countries. It is safe to say that this particular problem is the one that causes the greatest amount of grief to Koi pond keepers everywhere. Snails will have no effect on the planktonic algae problem because snails do not dine on planktonic algae forms but larval snails do eat planktonic algae but the quantities consumed are far too little to be noticeable. For natural control of planktonic algae blooms you have to look for plants that required vital nutrients in the water and and nitrifying bacteria. The two nutrients that are highly correlated with algal blooms are nitrogen and phosphorus. Nitrogen is dissolved in pond water in the forms of ammonia, nitrite, and nitrate. Phosphorus is present in the form of phosphate and in most cases it is the limiting nutrient--meaning that; the concentration of phosphate in the pond water will determine the extent of the algal bloom. If you cut the concentration of phosphate, you will reduce the degree of the algal bloom. Plants such as iris, cattails, and water hyacinth are good consumers of phosphates. The more vigorous the growth rate of the plants, the more effectively they will be able to compete with the algae for dissolved nutrients. Q: How can I control the algae? I have a cement-lined stone pond about 10 feet long by 5 feet wide by 3 feet deep. I am using rain water with a pH of about 7. 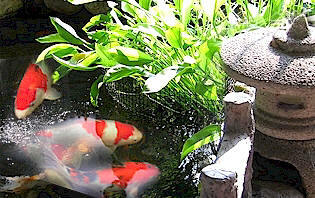 My pond contains six Koi fishes about 2 ft in length. My problem is that the water becomes murky and overloaded with algae. A biological filter is also a good competitor for phosphates. The nitrifying bacteria that populate the filter have a high phosphorus demand. Staghorn Algae outbreak due to nutrient imbalance (above pic enlarged to double its size). A properly designed and operating biological filter can clear a pond very rapidly despite of high nitrate contents. Biozyme-Matrix to clarify the water by enhancing the mechanical and biological filtration system thereby increasing the biological surface area by forming surface matrixes for biozyme to perform its optimum functions. Biozyme-Enhancer is a dried bacteria's and enzyme combination which are specially selected for the control and maintenance of water quality which have high organic build-up such as: Ammonia, Nitrites, Nitrates, Phosphates, Sludge, B.O.D., in ponds and aquariums.